WASHINGTON -- Striding into history, Hillary Clinton will become the first woman to top the presidential ticket of a major U.S. political party, capturing commitments Monday from the number of delegates needed to become the Democrats' presumptive nominee. The victory arrived nearly eight years to the day after she conceded her first White House campaign to Barack Obama. Back then, she famously noted her inability to "shatter that highest, hardest glass ceiling." Campaigning this time as the loyal successor to the nation's first black president, Clinton held off a surprisingly strong challenge from Vermont Sen. Bernie Sanders. He mobilized millions with a fervently liberal message and his insurgent candidacy revealed a deep level of national frustration with politics-as-usual, even among Democrats who have controlled the White House since 2009. Clinton, the former secretary of state, New York senator and first lady, reached the 2,383 delegates needed to become the presumptive Democratic nominee on Monday with a decisive weekend victory in Puerto Rico and a burst of last-minute support from superdelegates. Those are party officials and officeholders, many of them eager to wrap up the primary amid preference polls showing her in a tightening race with presumptive GOP nominee Donald Trump. Clinton has 1,812 pledged delegates won in primaries and caucuses. She also has the support of 571 superdelegates, according to an Associated Press count. The AP surveyed all 714 superdelegates repeatedly in the past seven months, and only 95 remain publicly uncommitted. While superdelegates will not formally cast their votes for Clinton until the party's July convention in Philadelphia, all those counted in her tally have unequivocally told the AP they will do so. "We really need to bring a close to this primary process and get on to defeating Donald Trump," said Nancy Worley, a superdelegate who chairs Alabama's Democratic Party and provided one of the last endorsements to put Clinton over the top. Clinton outpaced Sanders in winning new superdelegate endorsements even after his string of primary and caucus wins in May. Following the results in Puerto Rico, it is no longer possible for Sanders to reach the 2,383 needed to win the nomination based on the remaining available pledged delegates and uncommitted superdelegates. Sanders said this past weekend he plans to fight on until the convention, promising to make the case to superdelegates that he is better positioned to beat Trump in November. Superdelegates can change their minds. But since the start of the AP's survey in late 2015, no superdelegates have switched from supporting Clinton to backing Sanders. Indeed, Clinton's victory is broadly decisive. She leads Sanders by more than 3 million cast votes, by 291 pledged delegates and by 523 superdelegates. She won 29 caucuses and primaries to his 21 victories. That's a far bigger margin than Obama had in 2008, when he led Clinton by 131 pledged delegates and 105 superdelegates at the point he clinched the nomination. Echoing the sentiments of California Gov. Jerry Brown, who overcame a decades-long rivalry with the Clinton family to endorse her last week, many superdelegates expressed a desire to close ranks around a nominee who could defeat Trump in November. "It's time to stand behind our presumptive candidate," said Michael Brown, one of two superdelegates from the District of Columbia who came forward in the past week to back Clinton before the city's June 14 primary. "We shouldn't be acting like we are undecided when the people of America have spoken." Though she marched into her second presidential primary campaign as an overwhelming favorite, Clinton could not shake Sanders until its final days. He campaigned aggressively in California ahead of the state's Tuesday election, unwilling to exit a race Clinton stood on the cusp of winning. Beyond winning over millions of Sanders supporters who vow to remain loyal to the self-described democratic socialist, Clinton faces challenges as she turns toward November, including criticism of her decision to use a private email server run from her New York home while serving as secretary of state. Her deep unpopularity among Republicans has pushed many leery of Trump to nevertheless embrace his campaign. "This to me is about saving the country and preventing a third progressive, liberal term, which is what a Clinton presidency would do," House Speaker Paul Ryan told the AP last week after he finally endorsed Trump, weeks after the New Yorker clinched the GOP nomination. Yet Clinton showed no signs of limping into the general election as she approached the milestone, leaving Sanders behind and focusing on lacerating Trump. She said electing the billionaire businessman, who has spent months hitting her and her husband with bitingly personal attacks, would be a "historic mistake." "He is not just unprepared. 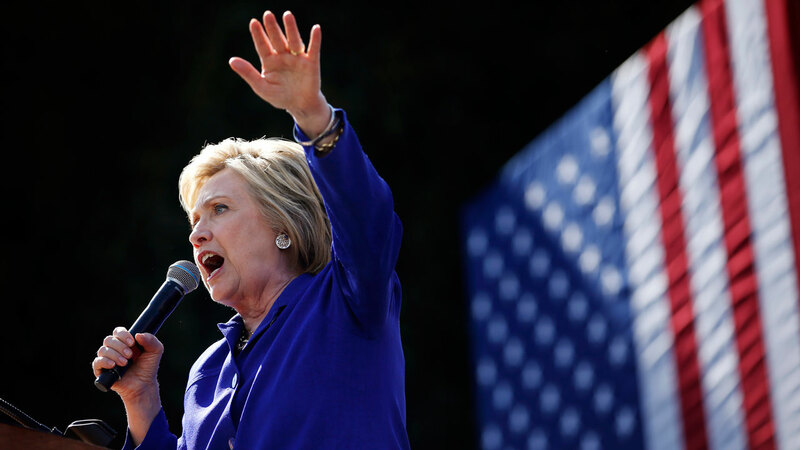 He is temperamentally unfit to hold an office that requires knowledge, stability and immense responsibility," Clinton said last week in a speech that was striking in its forcefulness, previewing a brutal five-month general election campaign to come. Even without the nomination, Sanders can claim ideological victory. His liberal positions pushed the issue of income inequality into the spotlight and drove Clinton to the left on issues such as trade, Wall Street and campaign finance reform. But she prevailed, in part, by claiming much of the coalition that boosted Obama. She won overwhelming support from women and minorities, catapulting her to decisive victories in diverse, delegate-rich states such as New York and Texas. When Clinton launched her campaign last April, she did so largely unopposed, having scared off more formidable challengers by locking down much of the party's organizational and fundraising infrastructure. Vice President Joe Biden, seen as her most threatening rival, opted not to run in October. Of the four opponents who did take her on, Sanders was the only one who emerged to provide a serious challenge. He caught fire among young voters and independents, his campaign gaining momentum from a narrow loss in Iowa in February and a commanding victory in New Hampshire. His ability to raise vast sums of money online gave him the resources to continue into the spring. But Clinton vowed not to repeat the failings of her 2008 campaign and focused early on winning delegates, hiring help from Obama's old team before launching her campaign. They pushed superdelegates into making early commitments and held campaign appearances in areas where they could win the most pledged delegates. Her victory in Nevada in late February diminished concerns from allies about her campaign operation. Decisive wins in Southern states on Super Tuesday and a sweep of March 15 contests gave her a significant delegate lead, which became insurmountable by the end of April after big victories in New York and in the Northeast. She now moves on to face Trump, whose ascent to the top of the Republican Party few expected. The brash real estate mogul and reality TV star has long since turned his attention from primary foes to Clinton, debuting a nickname - "Crooked Hillary" - and arguing she belongs in jail for her email setup. After a long primary campaign, Clinton said this past weekend in California she was ready to accept his challenge. "We're judged by our words and our deeds, not our race, not our ethnicity, not our religion," she said Saturday in Oxnard, California. "So it is time to judge Donald Trump by his words and his deeds. And I believe that his words and his deeds disqualify him from being president of the United States."